I haven’t eaten a rice ball in years. Even before paleo I only ate them on occasion because I would normally just get pizza when I went to the pizzeria. Rice is a food I’ve always loved, but have only eaten it very rarely since starting my paleo lifestyle. 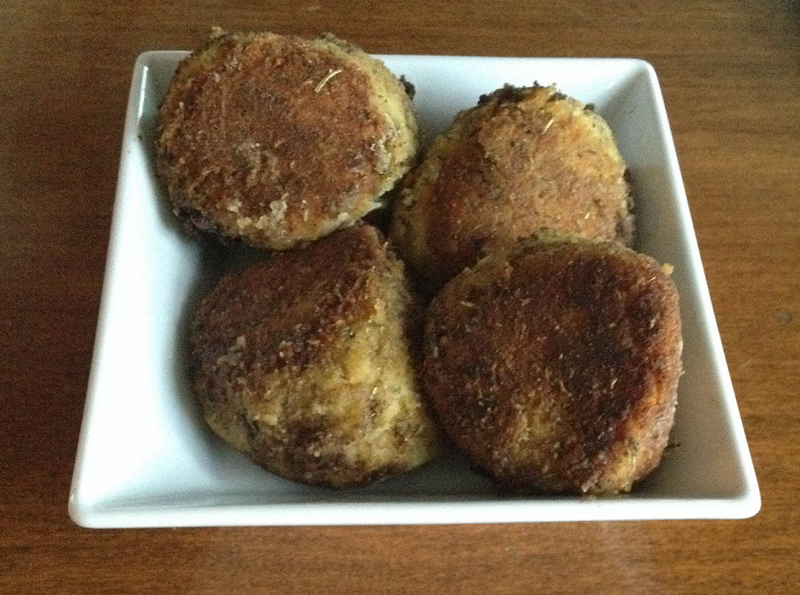 My cousin gave me the idea to make a paleo version of Italian style rice balls and I thought that was an awesome idea. If you can’t tolerate dairy, you can leave the cheese out of it, but it does taste better with cheese (of course). If you prepare the cauli-“rice” the day before and refrigerate overnight, it will drastically cut down the time it takes to prepare this recipe. If not, I would recommend saving this for special occasions because the cauli-“rice” mixture must be cold. These are great served with marinara sauce for dipping. Rice cauliflower in a food processor or with a cheese grater. Heat up a large skillet with butter, add riced cauliflower. Season with salt and pepper. Stir. Once the riced cauliflower is done cooking, remove from heat and mix with cheese and two eggs. Heat up large skillet and add butter, onions, and garlic. Cook for about two minutes. Add in ground beef. Break up and stir. Brown then add in basil, tomato paste, and marinara sauce. Mix everything together. Add peas, remove from heat. In a large bowl, combine coconut flour, tapioca flour, Italian seasoning, and baking soda. Take 2 tbsp of cauli-rice mixture and form into a cup with your hands. Add 1 teaspoon of meat mixture into cauli-rice cup. Add 2 teaspoons of cauli-rice mixture on top of the meat and roll into a ball. Roll the ball into the whisked eggs and then into the flour mixture. Heat up a large skillet. Add in olive oil. 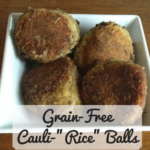 Fry cauli-rice balls until browned. Be careful, they are very delicate and break apart easily.